Gutters play an important role in keeping your home safe from water damage. Without them, your foundation can be weakened over time; water can seep into your basement, or at the very least, splash onto your siding or damage landscaping and foliage below. During the winter, gutters aid in directing the melting snow and ice away. Thanks to the choices of sectional gutters available nowadays, installing gutters is not too difficult for most do-it-yourselfers. The most important factor in deciding whether or not to tackle a gutter installation job as a homeowner is safety. At the very least, a ladder will be needed and the homeowner must decide if they feel comfortable working along the eaves of their home. It is advised to make use of protective gear such as harnesses, tie-ins and ropes. Plan ahead. Next to safety, planning is the next biggest component of gutter installation. Check the layout of your roof and the ground below. Know the positions of your downspouts ahead of time with consideration of where the water will be going from there. The idea is to keep the water away from the house, so for best results, direct it so that it flows naturally away with the lay of the land. Though the surface area of roofs can vary, a good rule of thumb is to allow for one downspout for about every 20 feet of gutter used. If your span is much longer, then try to put a downspout at each end of the run, with the highest point being in the middle, then sloping down to the two ends. Once you’ve decided on where your highpoint will be, recruit a volunteer to help snap a chalk line. 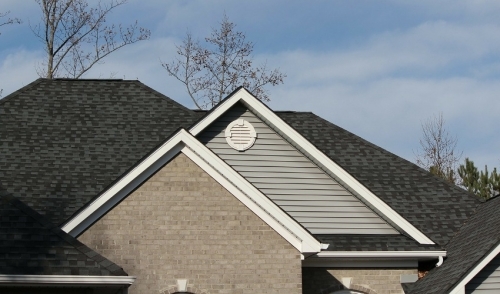 Measure ¼ inch downward slope along the roofline for every 10 feet towards the downspouts. At each end, hold the chalk line tightly on the measured marks and snap the string at the same time for a uniform, straight line. The one disadvantage of sectional gutters vs seamless are, well, the seams. The solution of course is to seal the seams effectively after joining the pieces together. Use an exterior grade sealant to do the job. There are products designed exclusively for gutters that will work best, so be sure to mention them when picking up your gutter materials. When applying the sealant, apply it inside the gutter, not outside. That will keep the freezing and thawing process from working on you seam during the winter. If you need to use any screws or rivets in your gutter, locate them on the sides only, never the bottom. While you’re up there, check for any other repairs that are needed. There’s no sense in fastening your shiny new gutter system to a fascia that is either rotting or otherwise in need of repair or paint. For more tips and advice on installing gutters on your home, stop in and ask our knowledgeable staff. We’re always happy to answer your questions and will help you to select the proper gutters, fittings and materials that can make your project as safe and problem free as possible.